Astronomers may have found a way to identify those Sun-like stars most likely to harbour orbiting planets. A survey of stars known to possess planets shows the vast majority to be severely depleted in lithium. To date, scientists have detected just over 420 worlds circling other stars using a range of techniques. Garik Israelian and colleagues tell the journal Nature that future planet hunts could be narrowed by going after stars with particular compositions. Scientists think events early in the star's formation may be responsible for producing the lithium phenomenon. 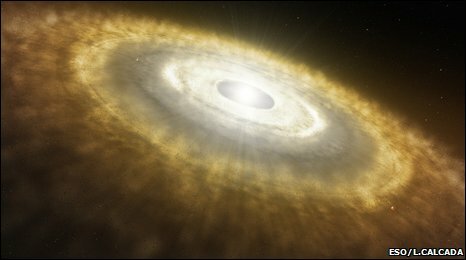 Theory holds that planets grow from a disc of dusty material that develops around infant stars. The researchers propose that this disc and its contents alter the young star's spin, mixing its upper layers more effectively into the interior where its contents can be "burnt" in the fusion processes that power it. "When discs form around stars there is interaction of angular momentum between disc, planets and parent star; and this interaction affects the rotation of the parent star and that will affect the lithium abundance," said Garik Israelian from the Instituto de Astrofisica de Canarias, Tenerife, Spain. The relative low abundance of lithium in our Sun's upper layers has long been a fascination for scientists. Researchers who have studied meteorites with compositions unchanged since the beginning of the Solar System say the element's presence in our star ought to be 140 times greater than is observed. Physicists know the Sun's upper layers as viewed today do not convect deeply enough to take any lithium to a location that is sufficiently hot to burn the element. This suggests mixing conditions must have been different in the past. The outcome of the research is a tool astronomers can now use to help pinpoint the right type of stars where they are likely to detect planets. "Suppose you had 50 or 100 candidates for parent-bearing stars," explained Dr Israelian. "Those which have a very low abundance of lithium will be the best candidates around which you might find planets," he told BBC News. Astronomers detect exoplanets, as they are called, using a number of methods. One technique looks for the gravitational "wobble" a massive planet will induce in its parent star. Another approach is to monitor a star for extended periods in the hope a planet will pass across its face. This transit reveals the planet's presence by making the star's light dim ever so slightly.